After you click the "Donate" button, follow the instructions to pick your preferred payment type. Thanks! Donations to CVTA can be tax deductible. See our tax deductible faq for more information. Every dollar goes to work. We do apply for and win competitive government grants to help fund many of our projects. However, these grants can pay only part of the cost of any one item. Private donations are needed also for each thing we buy to create the trail. We are lucky that occasionally people choose to make a significant investment in the future of the Cross Vermont Trail by making a major gift. We are happy to talk together with supporters to make the process easy. Multi year pledges, gifts in the form of stock, and other considerations - let us know what might make the most sense for you. If you would like, major gifts can be commemorated on the trail - on a bench at a scenic vista, with a plaque on a major structure. Your donation can help make real an important part of the trail, which can be dedicated to the memory of someone important to you. Let us know if this is something you'd be interested in talking more about. Donate building materials, or help us out with your equipment. Maybe you've got some stuff you are looking to get rid of that would be useful on the trail. Give us a call. If it is worthwhile we can haul it away at no cost to you. Businesses take note - donations of inventory to CVTA can be tax deductible. Can't afford to donate? Bargain sales are great too - give us a deal while recovering some of your original cost. 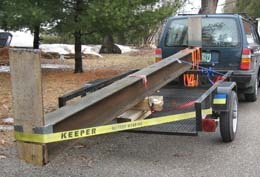 Or, do you have power equipment that you would be interested in bringing to use at a trail building project? Landscaping or construction material left over or salvaged from a renovation you have completed. The old culvert from when you put in the new, bigger one on your driveway. Stone or timbers used in small retaining walls. Tree seedlings that can be transplanted to areas along the trail that need to be revegetated. 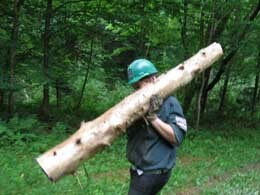 Standing timber you want to clear, but you don't have a use for the logs. Mulch hay that is no good for use with animals. Inventory you cannot sell such as lumber that is imperfect or wood stain nearing expiration. Hand tools, yard tools. A little rusty is OK. Shovels, wheelbarrows, hammers . . .
Volunteer to help us with your brushhog or weedwhacker. 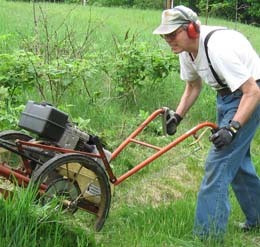 Bring out your small tractor with a bucket or a backhoe to a trail building project. Use your truck to help us pick up material donated by other people! Call us with your idea . . .